Charge Shot!!! : Playing "The Beatles: Rock Band" is Awesome! Playing "The Beatles: Rock Band" is Awesome! "Ladies and gentlemen... The Beatles!" Screams. Cheers. Applause. Tears. Thousands of adoring fans crying out for more. That's how it happened in 1965 when the Beatles opened their U.S. tour in Shea Stadium. (Or at least that's how I've heard it happened; I wasn't there after all.) And that's how it happens on The Beatles: Rock Band when you "open a show" (i.e. start a level) at the Shea Stadium venue. I know those thousands of adoring fans aren't real. I know that the shouts of excitement are coming from the speakers of a TV set and not from actual people. And I know that the songs to which I'm pretending to play along aren't even the actual live versions of the songs played in Shea Stadium, but rather remastered versions of the studio recordings. But standing in my buddies' living room, clutching a microphone, I still feel somewhat invigorated by the digital cheers. The Rock Band series, for my money, has always done a great job of simulating the crowd experience: they cheer wildly when you're playing well, they sing along when you reach the chorus, and they boo and hiss when you screw up. For most Rock Band players and viewers, the crowd reaction aspect of the game is usually pretty low on the list of things to pay attention to, falling behind the music itself, the "notes" flashing across the screen, and the visualizations: your musician avatars foolishly jumping around on stage. But, being a Rock Band junkie and a generally observant person, I noticed it. And, believe it or not, the crowd interaction was one of the aspects I most anticipated to see translated from the rest of the series into Beatles: Rock Band. At least for the early part of the Beatles' career, before their last paid live concert in 1966. But how would the Beatles: Rock Band system adapt to the reclusiveness of The Fab Four, its star characters? As excited as I was about the crowd effects for the earlier stages of the game, I was just as apprehensive about how the game would handle performances of the songs during the Beatles' studio years. I know the music should stand alone, but great as it is, I can't imagine that watching our heroes jamming out in the Abbey Road studios song after song would hold the attention span of the average Rock Bander, myself included. I'd heard about these fabled "Dreamscapes," and about the collaboration of Dhani Harrison (George's son, who, it would appear, has followed the same path of Christopher Tolkien, devoting a great deal of his adult life to enhancing his father's legacy). But how would it all pan out? I must admit that before I played Beatles Rock Band, these peripheral elements interested me more than the gameplay itself. I mean, I've played enough Rock Band to know how all the instruments work. I've certainly heard all the Beatles' songs before. And while listening to the music is a worthwhile pastime, pretending to play along to songs on plastic instruments is nothing new to me. And I thought, because I know the music so well already, that the new and improved visual elements would be the only truly unique aspects of the game. And, let's be honest, the Beatles' music, while revolutionary in its time, could hardly offer the virtuosic flair we've come to expect from the songs included in previous Rock Band titles. In terms of pure shreddage, how could George Harrison's bluesy lick for "I Me Mine" possibly compete with Kirk Hammett's ridiculous solo on "...And Justice For All," a downloadable song for Rock Band 1 & 2. How could Ringo's inane time-keeping in something like "Do You Want to Know a Secret" stand up to Neil Peart's impossible drum fills on "Tom Sawyer" or "The Trees." I'll just say what everyone was thinking: in Beatles: Rock Band, impeccable artistic direction and emphasis on historical context would have to make up for lack of depth and variety of song selection. Nonetheless, I was still excited about playing the game. While I was less than enthusastic about the prospect of fewer challenging pieces on the drums or guitar, I knew the vocals would be super legit (with or without the new harmonies feature), and I suspected that nearly all of Paul's bass parts would be more interesting to play than most Rock Band fare ("Eye of the Tiger," anyone?). Plus, I thought the peripheral elements would stand up enough to make the game an enjoyable and enlightening experience. And when I finally did get to play the game, I was not disappointed. Not only was I not disappointed by the small stuff, I was downright pleasantly surprised by a lot of the gameplay. Let the record show that I never underestimated the complexity of the Beatles' music. I only thought that the particular complexity involved might not translate into Rock Band arrangements that are interesting to play. But, oh, how wrong I was! Trying to replicate Paul's mastery of the bass - whether the rollicking dance beat of "I Saw Her Standing There" or the more advanced bass part that accompanies John's ahead-of-its-time stream-of-consciousness ballad "Good Morning Good Morning" - gave me analytical insights into the songs that it would have been hard for a non-bassist like myself to glean from listening alone. I also found (as I suspected) that sometimes the bass parts were more interesting than the guitar parts, due in part to the difficulties translating acoustic guitar into Rock Band format ("Dear Prudence." Also cf. "Tangled Up In Blue" from Rock Band 2) and in part to having the plastic guitar represent such blatantly non-guitar instruments as the violin ("I Am The Walrus") or the sitar ("Within You Without You" mashup). But in the parts that George Harrison played (especially on the songs that George Harrison wrote), you can tell from the guitar parts that he was a pretty expressive musician. 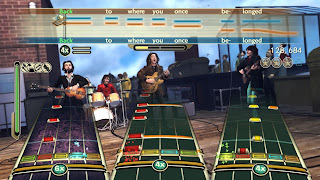 Even though the lead guitar part for one of George's most famous songs ("While My Guitar Gently Weeps") is actually played by Eric Clapton (previous Guitar Hero III appearance for "Sunshine of Your Love"). But the inclusion of the song says a lot about how George was feeling about the band at the time. Speaking of sneaky personnel changes, it wasn't actually Ringo playing the drums for "Back in the U.S.S.R." because he was estranged from the band at the time (Paul did the drums for that one). Despite that fact, we still see Ringo's avatar sitting behind the drumset when you play that song. Interesting choice about togetherness and post-band solidarity. But despite Ringo's reputation, playing Ringo's parts on Rock Band drums gave me a newfound appreciation for his talent... or, should I say, his bag of tricks? But a lot of it is fun to play, even if it's not challenging. And I'm a drummer, I should know. *Maybe this "pretend to play" phrase I've been using is too strong. I like to think of Rock Band in general less as "playing" an instrument, but as an exercise in really close listening mixed with really fast hand-eye coordination. And to look at the big picture of the game, I'll bet the songs they picked for inclusion, when taken together, provide a pretty telling history of the Beatles' career. But maybe that's a post for another time. Still, all these elements (the gameplay, the visuals, the insights, the historical context) combined for a pretty fulfilling game-playing experience for me. I don't know what my fulfilling experience says about how good this game was or why it was made. But it does say that playing it was awesome.